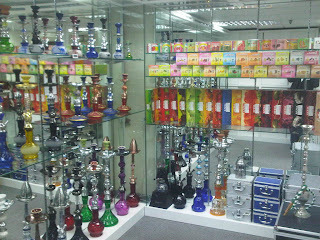 Located in Tsim Sha Tsui, Hookah Hutt has it all - flavours, coal and full set pipes. Shisha: Hookah Hutt stocks the always loved Al-Fakhir shisha (250 gram and 1kg boxes), and also carries the Nakhla brand (250 gram boxes). For the more health concsious, Soex Herbal Tobacco (50 gram boxes) is available here too. Flavours include Apple, Blueberry, Cherry, Grape, Watermelon, Strawberry, Mint, Guava and more. Shisha availability and prices vary month to month so call ahead to check for stock of what's in store this month. Coal: Hookah Hutt offers a few different types of the round quick-light coals ($20-$40/stick of 10) and japanese coals ($65 a box) - you will need a stove to light the latter. Pipes: If you're looking for a full new set up, Hookah Hutt has Package Sets so that you can get your home smoking experience started in no time. Pipes start from HK$555 onwards. Coal: If you have access to a stove, go natural (1. Coco Nara, 2. Olive, 3. Bamboo). If you're outdoors or on the go, pack yourself some quick light coals, available at both locations. Pipes: Hookah Hutt has a wide range of sizes, from table top to floor standing pipes. Nav at Hookah Hutt is a very friendly and helpful fellow shisha lover who is happy to set you up for your home smoking experience. Say hey from us!